Solar Options is the leading supplier of solar evacuated tube, hot water systems in the Eastern Bay of Plenty. 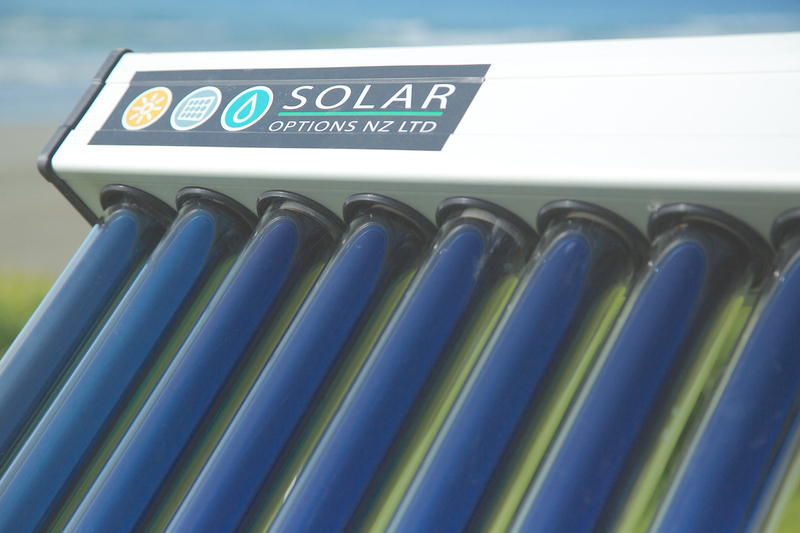 Solar Options NZ Ltd evacuated tube, solar hot water systems, works on sun light, not sun heat. Producing hot water on cloudy, overcast, frosty and even wet days. Solar Options has two different evacuated tube systems. One system is where the cylinder sits on the roof and the solar tubes are attached directly to the cylinder. The second solar hot water unit is where the evacuated tubes are mounted to the roof and the heated water is stored in a traditional hot water cylinder placed inside the home. We can divert excess hot water generated from our solar to other areas like spa pools and swimming pools or for heating. This can be totally automated or just set and forget. Solar Options also provides solar hot water systems for dairy sheds, swimming pools and other commercial operations like rest homes and holiday parks which can be scaled up or down to match the required needs and temperatures. The Solar Options, solar hot water system is an evacuated tube system of German design, tailored specifically to NZ climate and conditions. Tests carried out in Ireland and Australia showed that evacuated tube systems were over 130% more efficient than flat plate solar hot water systems. Through the most stringent testing and research we believe at Solar Options, that no other hot water system compares in quality, efficiency and out put. We all know how much a hefty monthly electricity bill can impact on family budgets. From research it has been proven that more than a third of an electricity bill is derived from heating household hot water. Solar Options guarantees that the average family household will make a savings of 75% on their water heating costs by installing a Solar Options solar hot water system. We’re happy to stand by and guarantee this product. Installing a solar hot water system in your home has the annual equivalence to planting 200 trees or removing a small car off the road. It will also reduce up to 1.5 tons of harmful gas emissions per year. Solar hot water collector 20 tube & 30 tube modular so can be expanded. DC circulating pumps – some that can run directly from small solar panel to work with solar hot water. Pressure booster pumps – to boost water pressure in the shower – different models. We are so confident of the quality and performance of our solar hot water systems that we offer a 10 year warranty on the collector solar tubes and a 7 year warranty on the aluminum framing.